Youngest of seven sisters, Meenakshi, is a normal 13-year-old girl in a quintessential little village somewhere in Maharashtra. She plays around in the village, has a tree as a friend and is pampered in her family. However, things start taking an unpleasant turn as her body develops and soon becomes the topic of conversation everywhere. The 13-year old’s innocent mind is unable to comprehend the nasty stares and unwanted advances by the boys who used to be her playmates just a few days back. But her body is reacting. Though not is a way she…or anybody else could have imagined. Catcalling, accidentally(?) brushing past, staring or making lewd gestures isn’t something a woman has not faced. And every time that happens, externally that woman may choose to ignore and walk away but internally she is ripping off the miscreant’s skin with her bare hands. When Meenakshi or Meenu as she was lovingly called, realized that she was being a subject to such demeaning things, she had a similar feeling. The only difference between her and any other woman was that she went ahead and did what every other woman could only imagine. But how did a girl of mere 13 years of age possess such kind of power and spite? With a broken heart and due to sheer helplessness, her parents decide to marry her off at a tender age of 13 and fervently pray that her past does not interfere with the promising future. Little did they know that destiny does not always answer to prayers. While growing up in a Mumbai, Meenakshi discovers some disturbing truths about herself. She relies heavily on love to help her live a normal life. But can love truly conquer all? Neil D’Silva’s stories have many qualities that make them stand out but for me, it’s his symbolic representations of profound philosophies that are woven in the plot which make his books extra-ordinary. I perceive Yakshini as a story of a woman’s battle against the world that sees her as an object. It tells a story of demons that reside in all of us and want to come out at the slightest provocation but are contained by the strong will power of our minds and social obligations. The main plot is interesting and writing is captivating. The story takes unpredictable turns and keeps the reader involved. It culminates in a climax that compliments the storyline perfectly. The characters especially Meenakshi, her husband, and her mother make an impact. In term of the horror quotient, Yakshini does not make you squirm in fear like the earlier D’Silva books. But the concept is more profound and forces you to think. Having read D’Silva earlier books viz. 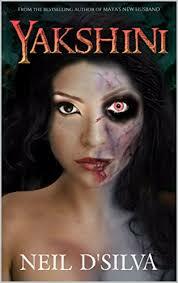 Maya’s New Husband, Pishacha and Evil Eye and the Charm, I was very sure that Yakshini is not going to disappoint. Maya’s New Husband has had rave reviews but personally, I believe Yakshini is best of the lot so far. Next on the list to read is Right Behind You.